After this year’s prolonged winter season, it’s time to celebrate the arrival of spring and the bears at Boyertown’s annual Coming Out of Hibernation event on Saturday, April 16, from 11 a.m. to 3 p.m.
Bears? Yes, two of the newest additions to Bear Fever, Boyertown’s community art project, will make their debuts at this block-party event. The bears mark the most recent outbreak of the ever-contagious Bear Fever that former Boyertown high school English teacher Jane Stahl and her students started in 2004 to foster community spirit and promote the arts. With the latest members, the collection now includes 61 bears. 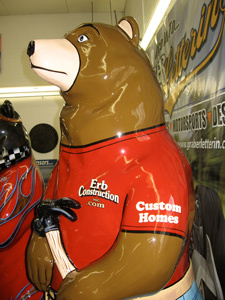 The new bears are “Rich,” sponsored by Erb Construction Inc., 208 S. Reading Ave., Boyertown, and painted by Jeff Graber of Graber Letterin’ Inc., 58 Schoolhouse Rd., Boyertown, and “Rod,” Dah Hot Rod Bear, sponsored by Loren and Jody Hulber, Macungie, and painted by Alan Johnson, Blairstown, NJ. 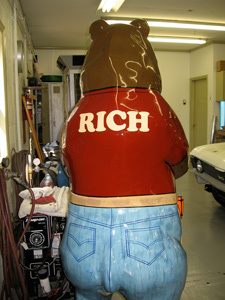 “Rich,” resembles the president and third-generation builder of the company, Rich Erb. 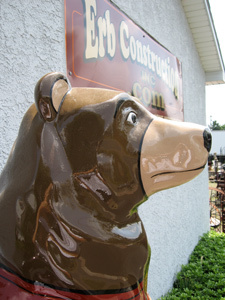 The upright bear holds a hammer in its paw and sports blue jeans, a tool pouch and a t-shirt with the company’s logo and Rich’s name. When he selected the bear, Erb asked Jeff to paint it because of his exceptional work. Graber, a 1987 Boyertown graduate, learned advertising design and commercial art skills at Berks Career & Technology Center. Then, after working for different sign shops, he launched his business in 1992. 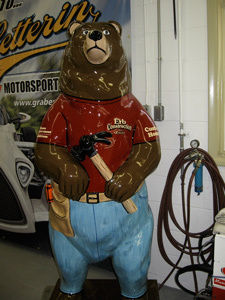 In addition to this bear, Graber painted the Bear Fever logo bear and “Billy,” a bear in memory of Bill Scheifley, which is located at Scheifley’s Hair Salon, 7853 Boyertown Pike, Boyertown. He also assisted with “Rod” by painting the red base coat and delivering it to Johnson’s studio.For more information about Erb Construction Inc. visit www.erbconstructioninc.com. For Graber Letterin’ Inc., visit www.graberletterin.com. ...Graber Letterin' has been creating high quality custom signage for businesses and the general public. The early years included lettering many race cars while at the same time we developed a reputation for providing many local business with high quality vehicle graphics, signage, and logo designs. While we still do race cars in our shop each year, it is our commercial vehicle graphics and signage divisions that have grown the most with the number of business related vehicles lettered each year having reached over a hundred. Graber Letterin', however, is not just a sign shop or vehicle lettering business. In addition to signs, banners, and vehicle graphics, we also offer imprinted apparel and stationery services like business cards and business forms to help you promote your company or organization in a very professional manner. Providing quality construction and building services to the Boyertown and surrounding areas for almost 40 years! Our mission and focus is to provide Boyertown and surrounding areas with honest hard work for their dollar. Our goal for every home building project is to complete that work in a timely matter, on budget and have a good time doing it. Company history: Back in the 50's Claude Erb started working in the area as a carpenter working on many new homes. Then in the 70's his son Don started working with him. New home building was a real priviledge putting people into a home they helped customize. Claude has since retired but not before seeing his grandson Rich come into the business. In 1995 Rich incorporated Erb Construction and hit the ground running. Since Don has semi-retired but he still can turn it on if he wants to. Rich has built over 45 custom homes in the area, many additions and countless home improvements. Rich and his crew go at it hard every week and are not afraid to work. Our overhead is low so we can pass it on to you. We're fully insured and are very clean and respectful of your property. 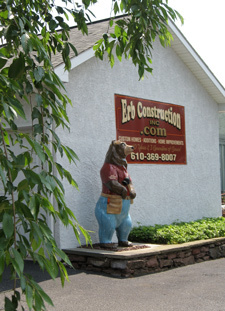 If you're thinking of adding on or just improving your home or building a a new one consider Erb Construction Inc.